With Scorpion, Drake makes a cohesive argument for broadening our attention spans and enjoying life's music, regardless of runtime. 2018 is seeing the peak of a major battle that has been brewing in the rap scene for a couple years, although its origins stretch back the '60s. No, it's not the beef between Drake and Pusha T (although that does factor into this album's story as well). It's not the old school vs. new school debate, which will never go away. No, the big debate as I see it right now is centered around the question of how long should an album be? In the streaming era, there are no limits. In fact, the more content that's available to stream, the more opportunity there is to rack up stacks (of fractions of pennies, of course). The rap scene especially has taken this incentive to heart, with artists like Migos and Rae Sremmurd releasing 20-plus-track albums this year. But more recently, Kanye West's seven-track barely-albums with Pusha T, Kid Cudi, Nas, and Teyana Taylor have made a strong argument for "all killer, no filler" 100-meter dashes instead of 100-minute marathons. When everything else around (i.e. social media) indulges our ever-shortening attention spans, why shouldn't albums do the same? But Drake's difference of opinion with the GOOD Music crew goes far beyond back-and-forth diss tracks as he counterargues with his newest release Scorpion that 25-track albums cannot only be enjoyable but essential to reminding us to slow down every once in a while. 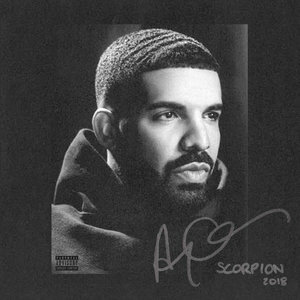 Split into two sides, Scorpion features both rap Drake and R&B Drake, though as always, those lines are blurred as he masters melodic earworms truly unmatched by most in modern music. I mean, who else can turn a fairly nonsense line like "She said, 'Do you love me?' / I tell her only partly / I only love my bed and my mama / I'm sorry" into one of the greatest showstopper moments of the year? Those tender mama's boy freestyle melodies will take center stage throughout side two of the album, but on the front end, Drake has some bars to deliver. Though the opening three tracks help in settling into the groove and buckling in for the next 90 minutes, "Emotionless" serves as the first essential track, featuring a Mariah Carey sample that reminds us of when she used to be more than train-wreck New Year's Eve performances. Besides that, Drake addresses his rumored fatherhood, responding, "I wasn't hidin' my kid from the world / I was hidin' the world from my kid." This statement comes after a lengthy indictment on social media culture, obsession with phones, and the shallow lifestyle many of us have indulged in, choosing to capture the moment for the clout, instead of soaking it up as it plays out. Many artists have keyed in on these problems recently, and Drake, here and throughout the album, wonders if the attention-seeking, instant gratification-driven lifestyle is something worthy of passing down to the next generation. The birth of a child certainly will lead to deep contemplation about personal values, as Drake continues the subject on "March 14": "Realize I gotta think for two now / I gotta make it, I better make it / I promise if I'm not dead then I'm dedicated." On the other side, death leads to those same self-evaluating thoughts, and with the passing of XXXTentacion still recent, Drake references the theft and murder on "Mob Ties" ("Louis bags in exchange for body bags"), while Jay-Z shares his frustration and heartbreak on "Talk Up" (Y'all killed X and let Zimmerman live"). All of this is pushing Drake towards a crave for real life, a crave he outlines on side one closer "Is There More" as he questions, "Is there more to life than digits and bankin' accounts? / Is there more to life than sayin' I figured it out? / Is there more? Yeah." Although not particularly novel sentiments, this is coming from the guy who seven years ago popularized YOLO as a philosophy for living fast and free e'ry day, e'ry day, e'ry day. While the album could have ended with side one and been a great release, Drake knew that he (and we) needed to take a longer breath and slow things down. So, in protest against the suffocating, fast-paced culture, side two is mostly comprised of slow R&B ballads featuring beautifully lush production from the buzzing synths on "Peak" to the feathery Michael Jackson feature on "Don't Matter to Me". And while listening to the entirety of the album from start to finish may seem a chore compared to our typical listening habits, taking it apart and deciding which could be left off is equally daunting. Of course, there are a few like "I'm Upset" and "Final Fantasy" that seem likely candidates. But in the long run, a few duds in 90 minutes of material doesn't seem too high a sin, especially considering the same concession could easily be made for a release like the Beatles' White Album. Thus, with Scorpion, Drake makes a cohesive argument for broadening our attention spans and enjoying life's music, regardless of runtime.